EVO Smart Console: Playstation Competition? With its EVO Smart Console, Envizions Computer Entertainment Corporation out of Atlanta, Georgia, has brought a Linux-based console to market that should appeal to both gamers and multimedia fans alike. Now in prototype, it is initially targeted at enthusiasts, developers and early adopters. It is set to conquer the mass market by next year. The EVO Smart Console runs on the company’s Fedora 8 compatible Mirrors Evolution platform. The device should reach the market at about $250 through a refund system, with Windows for an additional $100. its hardware consists of a water-cooled 64-bit Athlon Quadcore 64x2 CPU running at 2.9 GHz and an ATI HD 3200 graphics card. The console supports HD standards 1080i and 1080p, includes 2 Gbytes RAM, and runs a 120-Gbyte hard drive. The box supports the H.264 VC1 and MPEG2 multimedia codecs and emits video signals as DVI and HDMI. The EVO Smart Console strives to be an Open Source Playstation. The box is not only a game console, it incorporates desktop virtualization and biometric authentication (voice and fingerprint), serves as a DVD and VoIP box, and allows for data archiving. Envizions provides the applications partly on a cost basis via cloud computing. For this it provides a social network product called PitchBuzz.com and an Internet TV station, and integrates with a U.S. video-on-demand provider with over 10,000 titles. The result is a partially commercial kit and caboodle of hardware, software, and surrounding infrastructure -- a concept not unfamiliar to Nintendo and Sony. Not only that, but Envizions offers an accompanying EVO Energy Drink to increase customer "stamina, strengthen their immune system," etc. The machine is first and foremost a device with which to pass time. Games include Amiga and, from the Open Source realm, World of Padman, SuperTux and The Battle for Wesnoth. The online Evo:Direct service sells more games for downloading. Game developers can go to the Crystal Space site that provides space on Envizions's own servers. The company also promotes independent game developers on its Evo:Direct site so that they can see revenue from their creations. The Smart Console is available for developers and interested parties starting November 20th, at first only in the U.S. and Canada. 2009 is reserved for the Big Release, with software to follow out of the Envizions cloud. For quite some time the Nexuiz homepage has been hinting at a major announcement in March. Now the cat is out of the bag and hitting the community over the head. plese dont compare this two mashines. 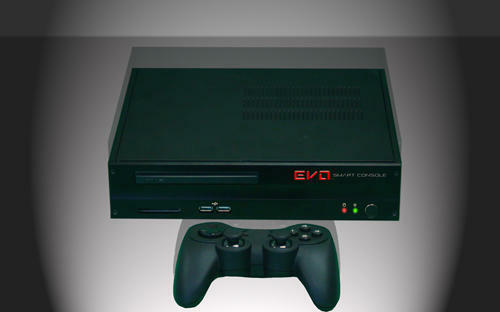 the hardver of evo smart console is funny against ps3 hardver. it doesn`t matter if is there 2gb ram or 256mb. optimalization and architecture is important. x86 architecture is the biggest mistake in cpu market. but what we can do, if is everything in IT just about market (last 10 years). thats all and sorry for this message from reality. makes me wonder whether the fact that today is april 1st has anything to do with this "console"
besides, the thing fails even as an idea since ps3 runs linux already. Where is the blue ray reader or even writer... VOIP ok harddisk ok. Fingerprint ? What use ? for identification and authentification => What about electronic ID card (see Belgium) for veryfiying? And electronic visa/paycard ? An electronic hand and finger move detector (handshoe) with touchdetection ? Helmet met projected 3D view ?.... Some idea's for expansion. Games : Wesnoth yes but what about flashy racing and Grand Theft alikes, prince of Persia, ... with nice visuals and HD resolution ? 1980x1080p ? This thing is nifty and all but SuperTux does not a console make. If it sells a few thousand units worldwide to some enthusiasts/devs it should be considered a success. In reality not only will it not conquer the mass market but won't even be a blip on the PS3 or XBox 360's radar. reality check: if this thing doesnt emulate every last gen CD-based its d.o.a., i could see people buying this for DC, PSX, PS2, sega cd, xbox emulation, but can it compete with the ps3? not gona happen.